Sadly, The Child Returns didn't win the Kindle Best Book Award for Fantasy, though it was a complete honor to be chosen as one of the five Finalists out of so many entries. I plan to enter the second and third books in the series next year, so wish me luck! 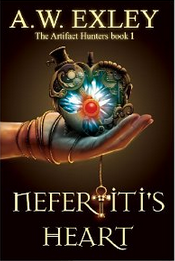 In the meantime, be sure to check out this year's fantasy winner, Nefertiti's Heart by A. W. Exley, here. It looks like a great read, so I'll be picking up my own copy soon (as soon as Book 4 is complete). Don't you LOVE that cover? You can also check out all seven winners (one for each major category) by following this link. Speaking of Book 4 (working title: The Reaper Rises), I've been making great progress so far. Current stats: 249 pages, 63,443 words. Unfortunately, my husband will be out of town for much of October, so my progress will slow soon, but hopefully I can complete the first draft and a few editing rounds by the end of November. Betas, are you ready to get your hands on it in December? For those of you who haven't started reading the series yet, I'm running a Read for Review over on Goodreads right now with my Never Too Old for YA & NA group. If you're a member of Goodreads, please head on over and sign up. It's a great group, so you should check it out even if you don't sign up for the R4R. Link here. And finally, the series has hit a few milestones recently that I wanted to share. On Amazon, The Child Returns received it's 50th review, bringing the book's average to 4.8 out of 5. On Goodreads TCR also received it's 90th rating. My average there is 4.41, which is awesome for a notoriously hard site. Overall, I have 137 ratings for all 3 books on Goodreads with a 4.55 average. Huge thank yous to everyone who has read and loved the Ærenden books, to those who have rated them, and most importantly to those who keep spreading the word. I really appreciate your support.